Best Abiquiu Easel with Melamine Top - A professional, heavy-duty painting easel that offers the same quality features as the Abiquiu Deluxe. The single masted version has a laminated 2 inch x 5 inch oak uprights providing solid strength. Can hold canvasses up to 120 inches high. Base width 29 inches and depth 30 inches. Handles canvasses up to 72 inches wide. Ceiling height: lowest setting of easel is 86 inches, highest setting is 150 inches. Heavy duty marine winch can lift up to 300 pounds. Includes middle canvas tray for smaller work. Shipping weight: 150 lbs. Ships partially assembled by truck. - Melamine Tab Tray - This beautiful Oak tool tray is 50 inches wide, 13 inches deep and 4-1/4 inches high. The top is fitted with a 1/8 inch thick Melamine surface which can be used for mixing color. This tray can be easily mounted or removed from the easel. Tab tray moves up and down smoothly with the use of the heavy duty pulley system. Tray features three drawers for supply storage: two measure 13-3/8 x 10 x 2-1/4 inches, and one measuring 16 x 10 x 2-1/4 inches. Shipped with easel (additional 50 lbs). 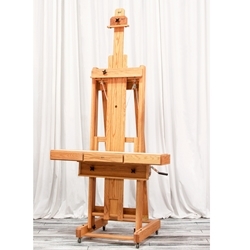 - Each BEST Easel is made of American oak, sanded to a smooth surface, then hand-rubbed with oil to reveal the inherent beauty of the wood grain. The craftsmen at BEST nail, glue, and wood screw every joint, guaranteeing strength and precision. Only the highest quality hardware is used as these easels are constructed to last a lifetime. The shipping cost of $99.00 applies to most areas of the 48 contiguous states. Some very remote locations which may involve a secondary carrier may require an additional fee. If this is the case to ship to your location, we will notify you prior to shipping for authorization. Hawaii and Alaska as well as international destinations require a separate quote. Ships partially assembled.